The town of Nantwich in Cheshire contains archaeological deposits of national importance. 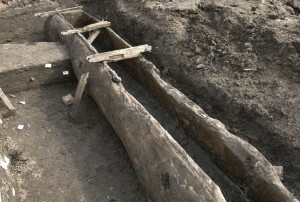 The Nantwich Waterlogged Deposits Project was commissioned by English Heritage to assess these deposits and to produce a management strategy to address their long-term preservation. Numerous archaeological investigations within the town of Nantwich over the last forty years have revealed a wealth of archaeological remains dating to the Roman, medieval, and post-medieval periods. Much of this material is preserved beneath or within a deep, sometimes organic, waterlogged deposit which, in places, is more than 3m deep. The quality of these waterlogged remains is exceptional and is comparable to the archaeological deposits at Carlisle, York and London. English Heritage has funded the Cheshire Archaeology Planning Advisory Service and SLR Consulting to undertake a multi-disciplinary strategic study of these deposits using archaeologists, geologists, hydrogeologists and GIS. The first phase of the project has mapped the extent of wet remains through desk studies and a programme of boreholes, has characterised the deposits and helped to understand what factors have led to waterlogging. The study has shown that much of the present historic town is constructed on, and dependent upon, accumulated levels of archaeological and often organic-rich sediments. This material is found not only in the former salt-working areas beside the River Weaver, but also uphill in the core of the medieval town. The project has allowed the extent, depth, nature, and preservation of these rare and important deposits to be understood more clearly so that a Management Strategy can be designed with the aim of continued preservation and to allow informed decisions on future development within the town. The Management Strategy has identified the area within the town where well-preserved, waterlogged archaeological deposits are known to survive in an Area of Special Archaeological Potential. This refines the Area of Archaeological Potential which was identified in the Nantwich Historic Towns Survey . The Management Strategy is intended to provide guidance on those construction techniques which will ensure the preservation of sensitive archaeological deposits and avoid the need for large-scale, time-consuming, and expensive archaeological excavation. This could be achieved through careful attention to construction and urban drainage techniques so that the underlying deposits within the town do not experience water level loss, change in water quality, or changes in groundwater flow. The second phase of the Nantwich Waterlogged Deposits Project was completed in 2016. This involved monitoring the water levels and quality in a network of dipwells established in Nantwich on a quarterly basis and helped to monitor the stability of the waterlogged deposits in the town. The results from the monitoring phase have been fed into the final Management Strategy.